While we are used to skim through the results for the most relevant results, the social buttons produce an artifact that disrupts the search index. 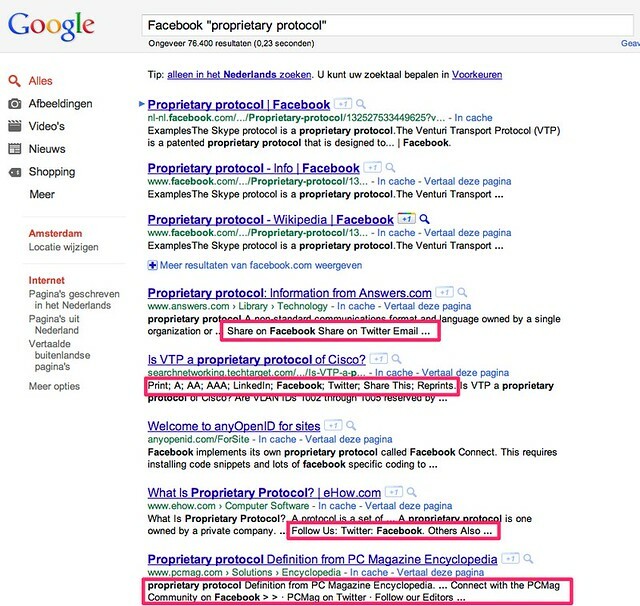 A result titled “Is VTP a proprietary protocol of CISCO?” is the fifth, unrelevant, result and is only shown due to the fact that they are using a Facebook social button on their website.The social buttons are flooding the index with keywords such as Facebook, Twitter, Share, Add that as a side-effect of sharing technologies. Because of the high penetration of social buttons this may also disrupt research practices on the web. 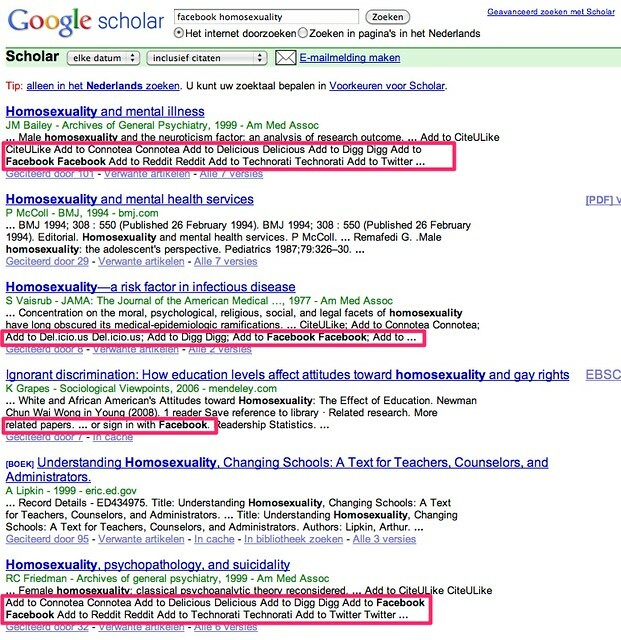 The following example shows what happens when you search for the keywords Facebook homosexuality in Google Scholar. None of the shown results are relevant for my query and are shown because of a Facebook social button on their website. Social buttons are producing an artifact that disrupts search. How Web 1.0 is the Issuecrawler? Hit, Link, Like and Share. Organizing the social and the fabric of the web in a Like economy. Are social sharing services breaking the web with data-rich hyperlinks? Previous Previous post: Are social sharing services breaking the web with data-rich hyperlinks? Interesting. But it’s probably limited to searches with big social network site names in it. Yes but that also makes research into those big social network sites difficult. Some kind of filter should be available for this issue. Like “searchitem1 searchitem2 -socialbuttons”. You know another thing that breaks search in the exact same way? The word “feed” and reference to newsfeeds (RSS/Atom). I do not specifically what I was searching for, but I do know that I had to tweak my search query quite a bit to get around this. I really really hope Google is going to do something about this. I can’t imagine they’re not aware of this issue because a lot of smart folks work there. Webpages and blogs nowadays produce many “technical artifacts” such as RSS and social plugins which break search. One would think Google would be able to think of a way to deal with these.